It’s such a cold and rainy day. Plus the fact that it’s a public holiday today (doesn’t affect me much, just means there’s no school activities on ^.^), makes one yearn to laze in bed all day long, and not do anything. But that’s not me, not when this is one of the few chances that I can bake! If you happen to look at yesterday‘s photos and happen to be sharp enough, you’ll spot that in the collage, there are cupcakes in the background. Yep! I baked some vanilla cupcakes together with the Ugly Chocolate Cake yesterday, and today I just need to frost and decorate them. I decided to use a vanilla cupcake recipe from one of the 500 series. 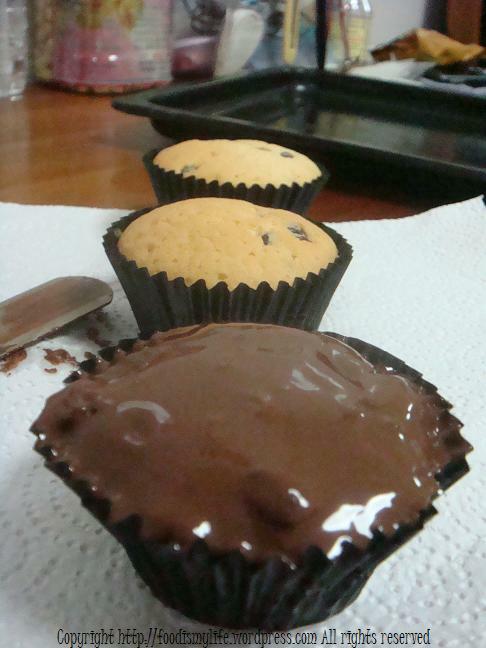 The cupcakes turn out to be pretty light, but at the same time, a little too moist to my liking. I prefer Nigella’s cupcakes. Both are equally easy to make, just that Nigella’s recipe requires a little bit more ingredients. And the funny thing is, I can’t get the cupcakes to stick to the cupcake papers, it’s as if they don’t like to wear the cupcake papers, and hence they end up becoming naked cupcakes. xD That’s another reason which makes me prefer Nigella’s recipe. And for the frosting, I didn’t use the recipe given inside the recipe book. Instead I used another frosting recipe that I got from a “I-cannot-remember-the-name-of-the-cookbook” cookbook. It’s originally called killer mocha frosting. And it really is a killer. Not in terms of the taste, but in terms of the mess it made in the kitchen. As I didn’t have a food processor, I tried to process everything using an electric mixer, which results in clouds of cocoa powder and icing sugar *cough cough*. But the resulting frosting is yummy and I’d probably not reduce the amount of icing sugar use the next time. The salted butter is used supposedly to bring out the cocoa taste, which I think also helps to offset the sweetness of the frosting. To make the strong brewed coffee, simply dissolve 1 teaspoon of ground instant coffee powder in 1/4 cup of hot water and let it cool to room temperature before measuring out 1/8 cup of it. Preheat the oven to 180 degrees Celsius. Line muffin tins with paper baking cases. Put the eggs, sugar, flour, butter and vanilla extract in a large bowl and beat with an electric whisk for 3 to 4 minutes on medium-high speed, until the mixture is smooth and pale. Divide the mixture between the cases. Bake for 15 minutes until well risen and golden-brown. Remove from the oven and cool for 5 minutes. Transfer to a wire rack to cool completely. 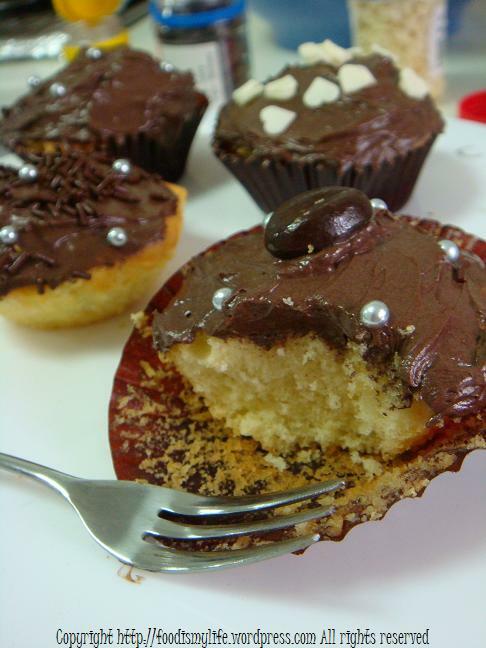 To make the frosting, process all ingredients in a food processor fitted with a metal blade, scraping down the sides as necessary. Either pipe or spread the frosting on top of the cupcakes. 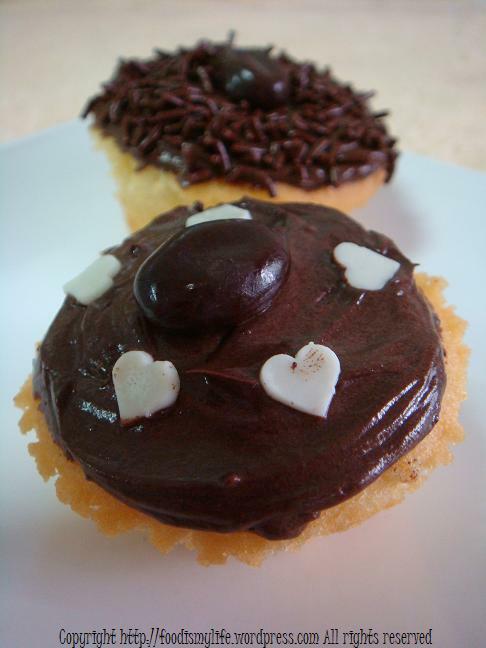 Decorate the cupcakes with chocolate-covered coffee beans and chocolate rice. I love the little hearts! I bet these cupcakes are just as tasty as they are cute! Well I’ve given you some of my opinion. Hope it helps! Lol.